In 1831, Dr. Havilah Beardsley (Albert Beardsley's uncle), purchased land at the junction of the St. Joseph and Elkhart Rivers from Indian Chief, Pierre Moran. With this $1,500.00 purchase, Beardsley founded the city of Elkhart, so named because an island at the rivers' conflux was believed to resemble an elk's heart. Beardsley stayed in Elkhart because he was the only physician in the area, and also because he saw the value of the rivers to the city's future growth. A Beardsley mill on the St. Joseph River, in the mid 1800s. He built the first saw, flour, paper and carding mills in the area. In 1850, he brought the Michigan Southern Railway to Elkhart, and donated land for the railway's machine shops. In 1848 Havilah and Rachel Beardsley built the first brick home in Elkhart. Since then it has been home to generations of Beardsley family members, and then a succession of private owners before coming into the possession of the Ruthmere Foundation in 2007. During the summer of 2012, the exterior of Havilah Beardsley House received extensive exterior restoration, as one can see from the picture above prior to restoration. The interior restoration was completed in 2015 and the site opened full time to the public on May 3. 2015. In attendance at this momentous event were descendants of Havilah Beardsley and leaders of the Pokagon Band of Potawatomi Indians, the cultural descendants of Chief Pierre Moran. Havilah Beardsley's home stands at the northwest corner of Main St. and Beardsley Ave., two blocks west from Ruthmere. Tours are April 1 - December 30, Tuesday-Saturday from 10am-3pm on the hour and Sunday, at 1, 2, & 3pm. Admission charged. The United States flag at the Havilah Beardsley House is maintained through a generous donation from Premiere Signs in Goshen, Indiana. 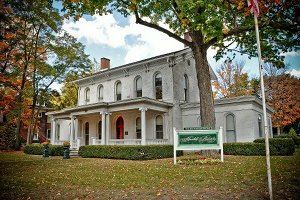 The Havilah Beardsley House received the 2015 Fairbanks Award for Community Beautification from the Greater Elkhart Chamber of Commerce. This is the second time in four years that the Havilah Beardsley House has won this prestigious award. 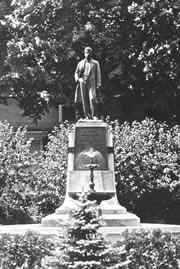 Havilah Beardsley Monument in Elkhart. This photo was taken circa 1913 when the statue was dedicated. It was erected by his nephew, A. R. Beardsley, the builder of Ruthmere. 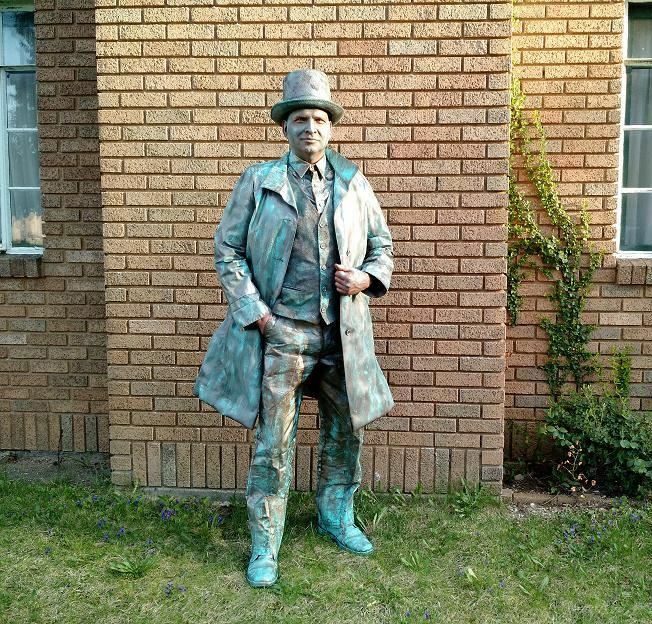 LiveStatue performed as the Dr. Havilah Beardsley statue at the Havilah Beardsley House Grand Opening on May 3, 2015. With the generous support of the Elkhart Truth, Ruthmere has created a high-profile traveling exhibit that explores Elkhart’s deepest roots. 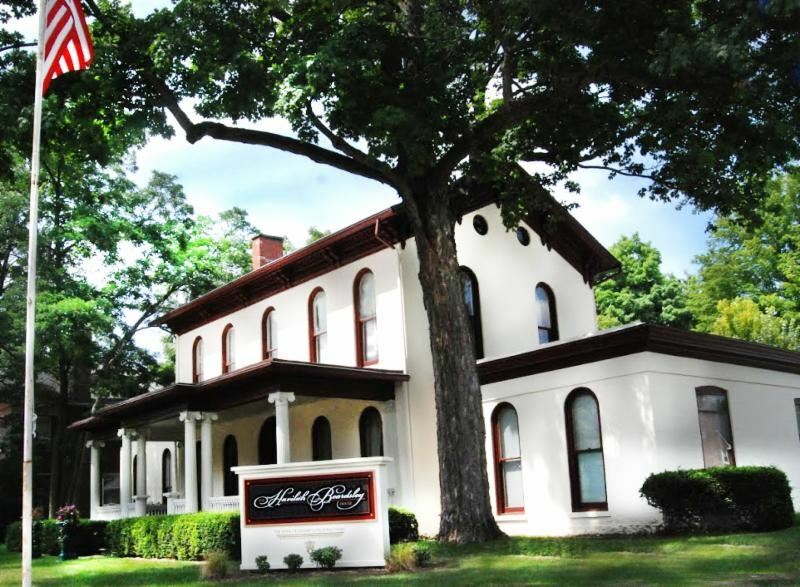 The focal point is the Havilah Beardsley House; the many mysteries that surround its past and the fascinating new discoveries that have been revealed through its restoration. The Havilah Beardsley House is much more than just an old house. While it’s true that it is one of the earliest standing structures in Elkhart County, what the house represents as a symbol for the Elkhart community goes well beyond bricks, mortar, stone, wood and glass. The home rests on the north high bank of the St. Joseph River, precisely at the end of the Main Street. Before there was a Main Street bridge, everyone in Elkhart could look north on Main Street to see the home of the city’s founder high on the hill. 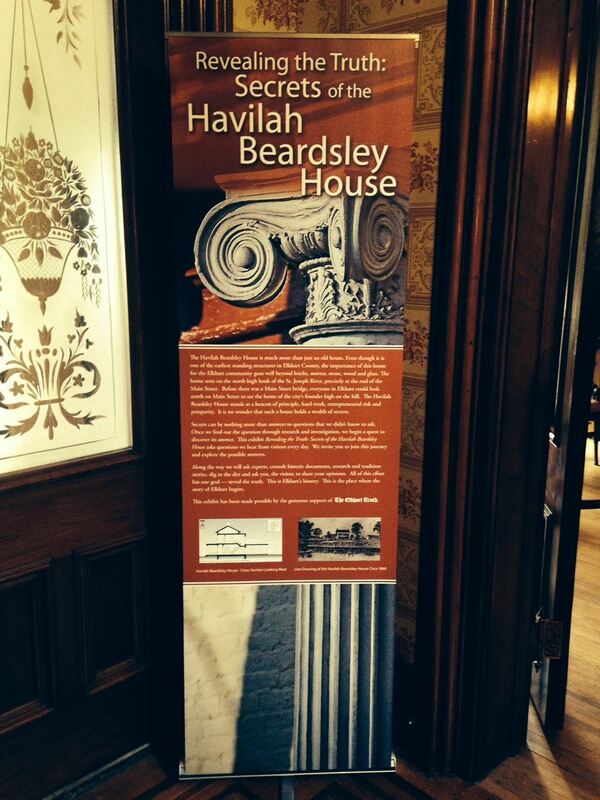 The Havilah Beardsley House stood as a beacon of principle, hard work, entrepreneurial risk, and prosperity. It is no wonder that such a house holds a wealth of secrets. This traveling exhibit, Revealing the Truth: Secrets of the Havilah Beardsley House, is organized around a set of 10 research questions. The exhibit comprises 11 exhibit banner panels approximately 60” x 18” each in size, artifacts from the Havilah Beardsley House collection if your site has secure exhibit cases, and an interactive cell/smartphone component. Full exhibit requires a minimum of 300 square feet of floor space. Not all banners need to be on site at one time. Exhibit can be broken up into smaller components and rotated. The exhibit is available for temporary 4-6 week exhibitions to museums, libraries, schools, galleries, municipal buildings, businesses and churches. There will be no exhibit fee to organizations within Elkhart County. Organizations located outside of Elkhart County may book this exhibit for $500 plus shipping expenses for a 4-week exhibition. Ruthmere is currently coordinating a 3-year traveling exhibition schedule from October, 2014, through December, 2017. Call 574-264-0330 ext. 104 to book this exhibit for your organization. Secrets can be nothing more than answers to questions that we didn’t know to ask. Once we define the question through research and investigation, we are on a quest to solve the secret. Along the way on this journey, we will ask experts, consult historic documents, research oral tradition stories and get our hands dirty by digging in the dirt. All of this effort has one goal—Revealing the Truth. This is Elkhart’s history. This is the place where the story of Elkhart begins.